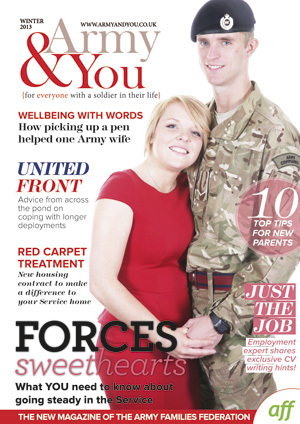 PUT the kettle on and order in some biscuits – the Winter 2013 issue of Army&You is out now! The second magazine since our relaunch features an in-depth guide into life as the boyfriend or girlfriend of a serving soldier, including the views of our cover stars Tilly Lambert and Adam Lee. Hannah Evans – best known as blogger and author the MOB – provides a humorous insight into the trials and tribulations of life as a mother of boys in an Army family, while super nanny Sarah Wheeler shares her top ten tips for new parents. We have the usual mix of news and features covering every aspect of Army life, from housing and education to the latest issues affecting Service families in Germany and Cyprus. The A&Y team are also delighted to have caught up with The Great British Bake Off’s Beca Lyne-Pirkis to chat cakes and camaraderie, and spoken to songstress Lydia Baylis about her military upbringing and her thoughts on the best songs to help families cope with the ups and downs of Service life. If all of that is not enough for you, we also have new cookery and retail therapy pages, a look at the Military Wives Choir and the chance to win a host of great prizes. Subscribing to Army&You is free and you can ensure you receive your copy by filling in this form. In the mean time, don’t forget to check out our digital edition by clicking this link.